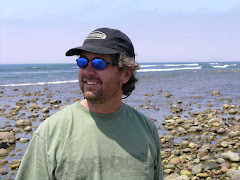 I just made my reservations to attend the premier aquarium tradeshow in California, Reef-A-Palooza 2008. Reef-A-Palooza is now in its fifth year. 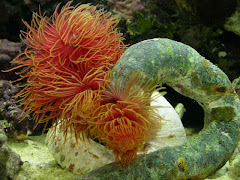 I attended the second annual Southern California Marine Aquarium Society (SCMAS) sponsored event back when it was held in the backyard of one of their members home in 2005. I was then on the board for the Western Marine Conference 2006 in Sacramento and was exploring and networking for our conference. 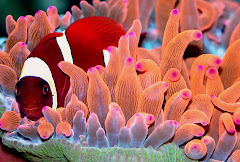 I look forward to seeing and reconnecting with some of the suppliers and coral growers that I haven't seen in some time; Reef Nutrition, Eco-Systems Aquariums, Jelli-quariums, Your Reef, Coral Farmer's Market, Reef Hobbyist Magazine, Frag Farmer, Marine Depot (Bayside Aquarium Supply) and Anthony Calfo. 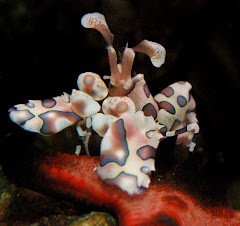 I recommend anyone that is either new to the reef keeping hobby, a seasoned veteran or a business person who may even have the slightest inclination to attend Reef-A-Palooza to do so. Whether you are a Southern California resident and are able to make it to Long Beach for a single day or an out of town attendee, I guarantee that you will leave with a wealth of knowledge and new contacts. 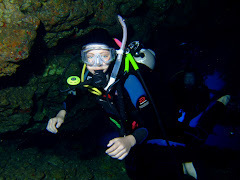 I plan on spending a few days prior to the event on Catalina Island enjoying the Avalon Underwater Park. 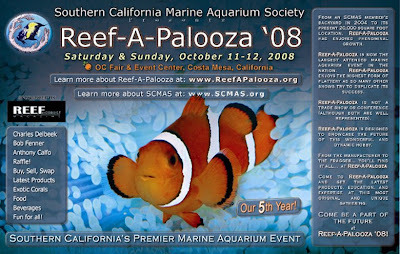 Reef-A-Palooza (RAP) is an annual event promoted by the Southern California Marine Aquarium Society (SCMAS). Now in its fifth year, RAP can best be described as an indoor marketplace where sellers, exhibitors, and hobbyists of all types can buy, sell, trade, showcase their products to the marine hobbyist community. The main purpose of Reef-A-Palooza is to provide an enjoyable, positive atmosphere that is conducive to education and trade of both product and knowledge. 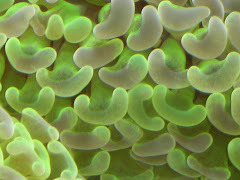 As such, participating vendors range from large manufacturers, to retailers, to small livestock sellers, and participating hobbyists range from the beginner to the elite, rare-species coral farmer. It is the perfect venue to showcase new products in the marine aquarium industry as well as retail products for sale. We strive to rally a diverse range of participants into the one-day event so as to present the best value and interest to everyone involved. Considering our current bookings and the popularity of previous years, we expect 70+ vendors/exhibitors and well over 2,500 attendees this year! Southern California is one of the most prolific areas in the world for the marine hobby in terms of retail, supply, and demographics. 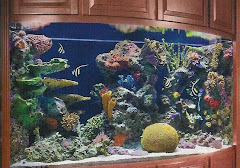 The density of marine aquarium hobbyists living within the greater LA and Orange County area is simply phenomenal! As such, we fully leverage this advantage by properly directing resources to proactively promote Reef-A-Palooza far in advance of the actual event. Significant effort is made to advertise the event effectively, such as posting abundant signs, distributing postcards, and providing other similar displays to various retail locations. Booth rates are extremely reasonable and affordable. 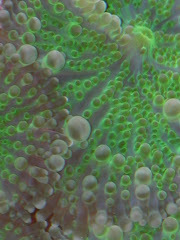 Reef-A-Palooza is focused mainly to cater to the vendor and hobbyist, rather than as an educational conference. As such, we tend to attract customers who come specifically for the purpose of buying and seeing all the different exhibitor’s booths and displays. Nonetheless, speakers, raffle drawings, and other entertainment are provided to help keep people around for most of the day, even after seeing all the booths. In addition, our promotional and marketing efforts are nearly guaranteed to attract high participation and attendance rates, and hence, heavy foot-traffic throughout the building. RAP 2008 is going to be HUGE this year due to the popularity of its venue (Orange County Fair & Exposition Center, Building #14) as well as the number of sellers, vendors, and manufacturers involved. We now have 18,000 square feet of indoor, climate-controlled space in which to make this event a resounding success. Now into its fifth year, Reef-A-Palooza has quickly gained the reputation as an event that is NOT to be missed!